Dux-facti is ideal for small businesses, independent contractors, freelancers and entrepreneurs who want to send professional-looking estimates and invoices in seconds. Customize your billing documents with your own logo, payment terms, and specific information. Change the colors, fonts, legends, etc. Save time, transform your estimates into invoices and with recurring invoices, duplicate them. … as well as on the playStore for your Android smartphone. 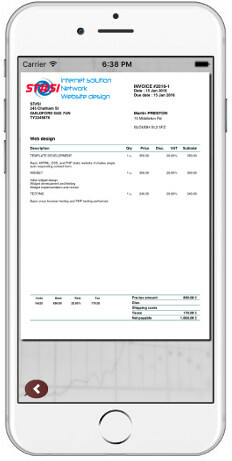 • Create estimates, invoices, credit notes in PDF, with previewing, printing and send via e-mail. • Manage your company info, products, product families, customers, customer families and settings for your PDF documents. Import contacts into customer records. 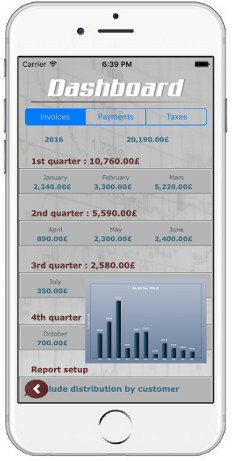 • Totals and taxes (Three VAT rates) get calculated automatically. • Manage discounts, convert estimates to invoices, manage down-payments. • Dashboard with PDF reports and graphic representations of sales. 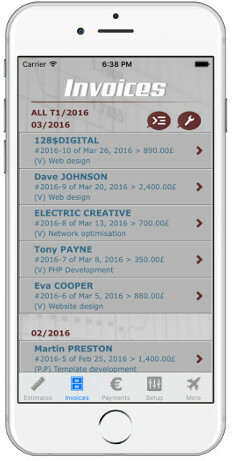 • No subscription required, no registration, unlimited creation of estimates and invoices in your device’s database. Mono-device app. • Help is included with the get-started guide. Got questions? Dux-facti contains direct access to email support. Invoicing is tedious but necessary to get paid faster! 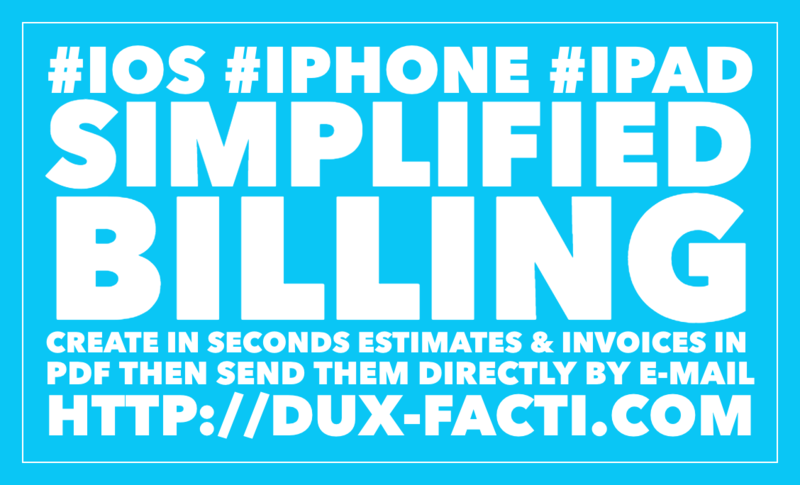 Automate your invoicing process with Dux-facti so you can devote more time to clinch your sales. 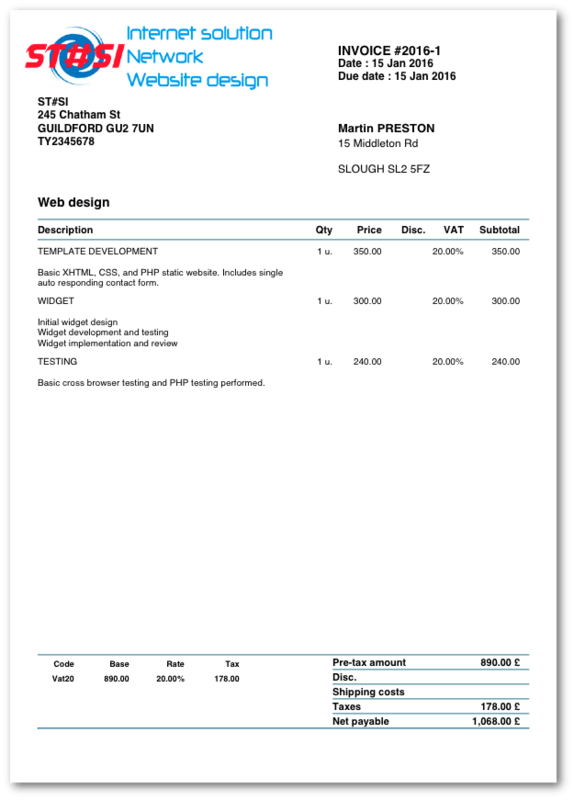 Here is an example of the default invoice template that ship with Dux-facti. All columns can be renamed through the app. A logo has been put in place to show where yours can go. Let your customers affix their signature directly on the estimates. Integrate your sales conditions, catalogs, specifications, photos in Dux-facti. Export for external backup of your databasea and PDF files. Create your own photo-based catalogs in PDF and screen presentations.